We climbed to the summit of Black Mountain with fresh eyes. “I’ve wanted to climb that mountain for 20 years.” “I’ve been looking at that mountain the entire time I’ve lived here and never been up on top”. 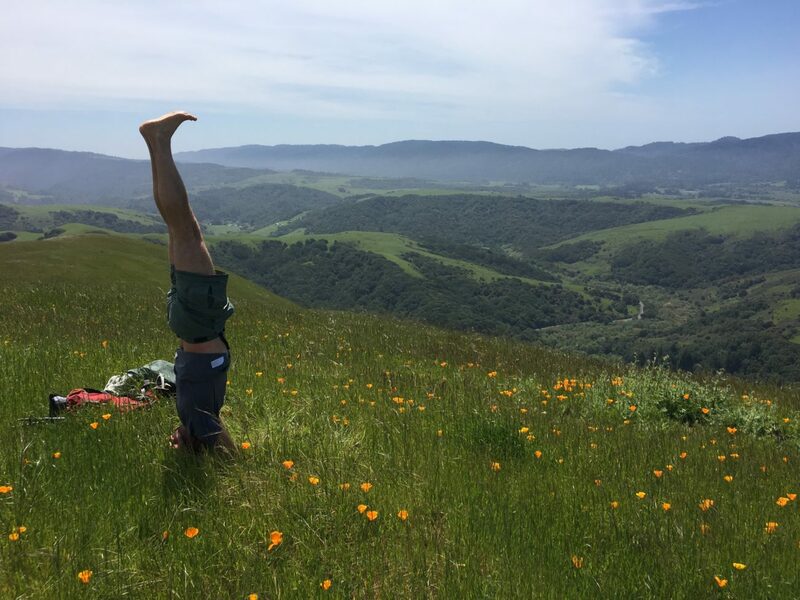 “I’ve waited to climb this mountain my entire life.” These were the comments heard as a group of 53 people climbed Black Mountain near Point Reyes National Seashore on Earth Day. Black Mountain is an icon on the landscape and is sacred ground for the Coastal Miwok tribe. It is currently owned by Black Mountain Ranch. Many of us have looked up at it in awe because of it’s shape, color and ability to catch a pink glow in late day light. For one spectacular bright sunny day we came together to look at the mountain with fresh eyes, from the top. We walked in silence up the mountain. We watched herds of cattle run from us in the green grass and hawks float in the uplift of the hills. Along the ranch road California poppies seemed to light our way to the top. As we arrived at the top, no one said a word. It was a moment of seeing our landscape with fresh eyes and wonder. To the north the hills were green, to the west the Pacific Ocean, to the East a slight moon rising and to the South the Lagunitas Creek watershed and Mount Tamalpais. As I looked to the south, one participant stood on his head looking out. It was if seeing this landscape from the top for the first time was so inspiring it required looking out with as many angles as possible! What was it about this mountain, on this day and this group of people that created such energy? The Black Mountain Circle received permission from the land owner to organize this Earth Day event. Black Mountain Circle “cultivates resilience, community, and earth stewardship in perilous times. Through inspiring events and insightful conversations, we reclaim our personal and collective stories about nature and spirit.” They brought together a group of naturalists and Coast Miwok, Sky Road Webb to guide us up the mountain. This was an intentional walk, a walk to look at the land and ourselves with fresh eyes. Sky Road Webb helped us stretch our assumptions about our connections with the land through Miwok songs, chants, and stories. We were stretched by speaking Miwok, playing instruments, eating new foods, and meeting new people. It was as if the mountain gave us all permission to put our usual “hiking” rituals aside and become a community on top of Black Mountain. I stood in awe as one naturalist recited a reading by heart from John Muir. He wove our fresh eyes with Muir’s amazing ability to weave a new appreciation for the land that is mind, body and spirit. What was it about this day that helped us all to see the land with fresh eyes? Was it because we were looking down instead of looking up on the mountain? Was it the hundreds bees and butterflies feasting on the poppies and barely noticing us? Or was it that we had created space in our day to look out and be curious? What familiar place could you go to this week to look out with fresh eyes? To the top of your building? On a bridge over a local creek? Standing on the beach? What do you see? What are you noticing that you never saw before? Enjoy the journey! Awaken your senses and see what’s possible.